DC NearlyWeds: The Ensemble -- Alternately Titled, "Go away, Mr. JeffMemorial!" The Ensemble -- Alternately Titled, "Go away, Mr. JeffMemorial!" We're under the 70 day mark, which is just terrifying and exciting all at the same time. I now regularly get that "Oh my god! I'm getting married!" feeling. I mean, it's really happening! This does, of course, lead me to dwell on details. (A bride dwelling on details?! Next thing you know, I'll be telling you the sky is blue and water is wet!) Recently I've been pondering my whole wedding ensemble. It's taken a few months, but the whole look as finally come together... I think. 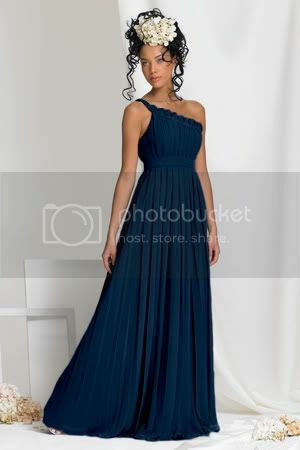 It's the dress picture above in this color (navy blue, for the click-through phobic), and no that's not me. I also have the shoes. 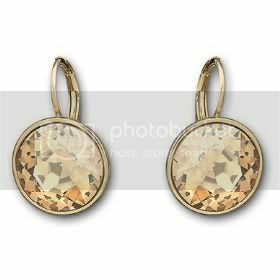 I have Swarovski Bella Golden Earrings. 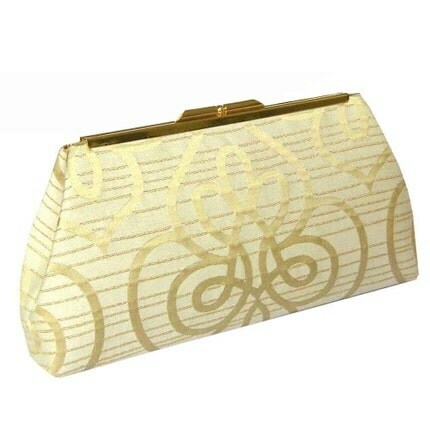 And I have a cute handmade clutch from Etsy seller "UpStyle"! But I'm not really sold on wearing a necklace. I've asked a few people, and they're sort of split down the middle between "Absolutely no necklace! It'll take away from the dramatic neckline," and "Of course! That dress screams for a necklace!" God, I feel silly writing this--pondering extensively over whether to necklace or not to necklace. I guess it's one of those things where, since I very rarely get dressed up, I want to do it right. And it's not just the necklace. It's an overall ensemble anxiety, which sounds pretty ridiculous. I love all of these pieces separately; let's hope they play well together, as well. I am, however, inclined to say no to the necklace, favoring the "dramatic neckline" which is sad because there are so many beautiful bridal necklaces out there. Part of me wonders if maybe I should have left a few actually important projects to the end of this planning process, heh. Then I wouldn't spend actual time thinking about frivolous stuff like this. Or maybe I should spend more time on my homework. What little things did you surprisingly get hung up on? Personally, I'm very minimalist when it comes to jewelry -- I definitely subscribe to the "less is more" philosophy! Those earrings are beautiful and I love the dramatic neckline. If it were me, that's what I would stick with. :) But I'm sure you'll be gorgeous either way! Congratulations on being 70 days away from the big day! I definitely don't think you're silly for pondering your neckline! You're a woman and this is your wedding day. You want to look your very best, just as you said, and that, my friend, is normal. I personally agree with Meg, that the neckline of the dress is dramatic and beautiful on its own. My suggestion would be to bring the necklace, so that on the day of your wedding if you feel like something is missing, you can throw it on and rethink it. My guess is that you're just going to know whether it works on not that morning, because it may all just depend on your mood that day! First of all CONGRATS! Second, I always get hung up on accessorizing...I find the perfect ensemble, but I always need certain accessories to make it just right! Us silly girls!!! yeah I am having the same thoughts about my accessories, my bridesmaids, groomsmen... will everyone look coordinated enough? are my accessories going to look as good together as they do separately? etc etc. it's normal to overthink it, but probably also a good idea to remind yourself that you're going to look amazing no matter what, the wedding is going to be great, so don't sweat it too much. but I agree with Miss JeffMem, if you have a necklace in mind, bring it with you to wherever you're getting ready that day, in case you feel like adding a bit more. I think with that dress you could really go either way! I fall on the dramatic neckline side of the debate. I'm a minimalist with jewelry, too, unless a dress is plain, in which case I cry, "Pile on the pearls!" (Pearls being my jewel of choice for several reasons.) If you're just hankering to buy a necklace, you could always get yourself something to wear on the honeymoon. Its funny because I was just obsessing over this same exact thing. I ended up scaling down my necklace because I wanted to stay a bit more classic in that regard considering my dress was already not so traditional. I think that may be the way you could look at it as well.